Heinz has received a $2.25 million fine for claiming high-sugar snacks were healthy. The company said its Little Kids Shredz snacks - marketed for toddlers until they were pulled from shelves in 2016 - were beneficial. The Shredz snacks were a dehydrated product made from 99 per cent fruit and vegetable ingredients that did not contain any preservatives, artificial colours or flavours. However, they had a high sugar content. 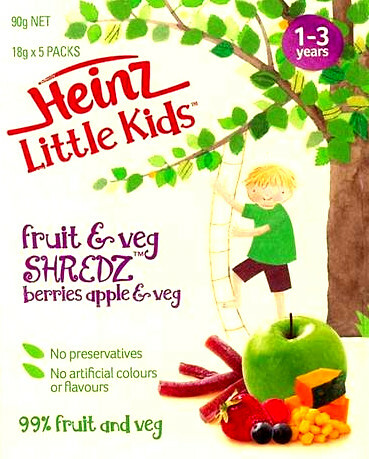 “Heinz nutritionists ought to have known that a representation that a product containing approximately two-thirds sugar was beneficial to the health of children aged one to three years was misleading,” Justice Richard White said. The federal court imposed the penalty and also ordered the company to set up a consumer protection compliance program. The Australian Competition and Consumer Commission (ACCC) wanted a $10 million fine, but Heinz said about $400,000 was more appropriate. “The nature and characteristic of the conduct in this case is very serious, indeed it's egregious,” Tom Duggan, a lawyer for the ACCC told the Federal Court. “The consumer [was] being diverted from other products which may be healthy,” Mr Duggan said.